An trangkaso amo usa ka sakit nga nakakaabat hin nakakatapon nga mga sintomas hin hiranat, ubo, sip-on, sakit ha but-ol, lawas ngan ulo. Beigel JH, Farrar J, Han AM et al. (September 2005). 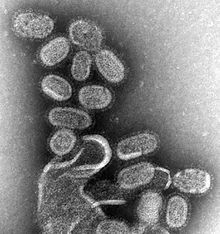 "Avian influenza A (H5N1) infection in humans". N Engl J Med. 353 (13): 1374–85. PMID 16192482. doi:10.1056/NEJMra052211. Baron, Samuel (1996). Medical microbiology (4th ed.). Galveston, Tex: University of Texas Medical Branch at Galveston. ISBN 0-9631172-1-1. http://www.ncbi.nlm.nih.gov/books/bv.fcgi?rid=mmed. Cox NJ, Subbarao K; Subbarao (October 1999). "Influenza". Lancet 354 (9186): 1277–82. PMID 10520648. doi:10.1016/S0140-6736(99)01241-6. George Dehner (2012). Influenza: A Century of Science and Public Health Response. University of Pittsburgh Press. ISBN 978-0-8229-6189-5. http://books.google.com/books?id=DTp9tQAACAAJ. Webster RG, Bean WJ, Gorman OT, Chambers TM, Kawaoka Y; Bean; Gorman; Chambers; Kawaoka (1 March 1992). "Evolution and ecology of influenza A viruses". Microbiol Rev. 56 (1): 152–79. PMC 372859. PMID 1579108. Steinhauer DA, Skehel JJ; Skehel (2002). "Genetics of influenza viruses". Annu. Rev. Genet. 36: 305–32. PMID 12429695. doi:10.1146/annurev.genet.36.052402.152757. Horimoto T, Kawaoka Y; Kawaoka (January 2001). "Pandemic threat posed by avian influenza A viruses". Clin Microbiol Rev. 14 (1): 129–49. PMC 88966. PMID 11148006. doi:10.1128/CMR.14.1.129-149.2001. Ini nga pakli kataposan nga ginliwat dida han 13:55, 22 Enero 2015.